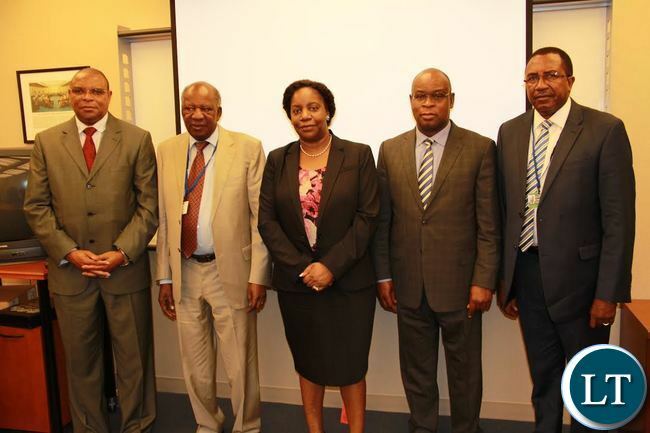 Chikwanda, Mr. Yamba and Dr Kalyalya after paying a courtesy call on Ms. Kapwepwe at the IMF offices in Washington DC. FINANCE Minister Alexander Chikwanda has attributed the appreciation of the Kwacha in the last two weeks to interventions on the monetary side of the economy. Mr Chikwanda said that Government had embarked on a number of interventions from both the fiscal and monetary sides including the review of fuel subsidies and procurement processes, review of electricity tariffs to improve investment in the sector and reduce government spending as measures to respond to the shocks in the economy. He observed that there had been a lot of speculation prior to the assurances from the mining sector of continued mining activities. The Minister was speaking when he and his delegation paid a courtesy call on outgoing Ambassador to the United States Palan Mulonda the Zambian Embassy in Washington DC on Wednesday. Meanwhile, Mr Chikwanda and his delegation also paid a courtesy call on International Monetary Fund(IMF) Group 1 Constituency Executive Director Chileshe Kapwepwe at the IMF Headquarters in Washington DC, United States of America (USA). The minister took time to explain the measures that Government had initiated so as to manage the shocks in the economy. This was in response to Ms Kapwepwe who informed the Minister that the IMF was keen to learn what measures the Zambian Government was taking to respond to the shocks in the economy. Mr Chikwanda explained that programs had been put in place to diversify the economy by making agriculture the mainstay of the economy. The Minister added that climate change had resulted in erratic rainfall patterns affecting the development of this sector especially the irrigation system because ground water was depleted. He added that there was however need to take stock of agriculture activities in order to come up with comprehensive programs to revitalize the sector. The measure bwana minister you are referring to are working but at what cost. There is reduced activity in the Zambia economy due to reduced liquidity on the market through the OMO. What you are not reflecting is the number of children going to bed on empty stomaches based on this animal called Open Market Operation (OMO), which means reduced kwacha in the economy to buy the dollar. In simple terms the business for small traders like the cross border trading is in deep trouble and you are happy to tell the nation that things are okay. Nooooo what happened to ‘its global ‘? This Jurassic must retire in August. Curbing kwacha fluctuations is very important, but needs to be balanced in such a way that small businesses and people are able to access funds and banks able to lend much cheaper than is the case now; in short, we need liquidity of some kind. The measures in place don’t seem to reflect this fundamental goal. I can assure you reading the Finance Minister statements, one can easily tell they are mixed up and pointing in every direction of the wind hoping something will make sense. Running an economy requires planning (direction), executing, and reviewing. I am wondering what the PF plans are, who has been communicating them, and what PF is doing in response to the inflation, job losses, corruption etc. PF please don’t do this. I just defected to the UPND and at the rate we are moving, there will be no campaign issues to discuss. How come you have signed the constitution?. How come UNZA and CBU are opening? How come the Kwacha is appreciating. How come the maize harvest expected is bumper. Please don’t continue to do good things. We need topics to discuss as an opposition. That is what is in the mind of Sampa thus why the boy is claiming that BOZ is selling dollar. Yesterday Sampa said the appreciation of the kwacha was artificial and not supported by strong fundamentals in the economy but enraged and clueless cadres showered him with insults. He dared the govt to deny they haven’t intervened by pumping hard earned reserves in the economy, here now Chikwanda admitting publicly they did just that. So there’s nothing to celebrate about the superficial currency upward move, in point of fact it’s time to begin worrying because once they have completely depleted the reserves the the Kwacha will resume it’s decent into valuelessness at frightening sputnik speed. It’s time for Lungu to organise more prayers for copper prices to rise and save us from total ruin. It will be HH and GBM Vs ECL and CK ( Chileshe Kapwepwe). Meanwhile the entire UPND is infected by the contagious diarrhea of insults from the mouth of their Vice President. VIVA Lungu, the Chosen one!! Typical PF cadre cannot make a sensible contribution to a subject that requires education and common sense. So Bwana Miminster are you telling the nation that what you have said has also helped he RAND,RUBO OF RUSSIA,PULA and other currencies like the Japanese YEN to appreciate against the world major currencies?Don’t take us for a ride we also follow wolrd current affaires please! As seen from the above comments from our unfortunate dull PF friends, they do not understand that the appreciation of the kwacha is solely due to monetary policy which in short is pumping in dollars in the economy while restricting the kwacha. This means with regards fiscal intervention which is more important, nothing is happening and once the dollars are wiped out, we will be be back to square one. Isikulu ba PF please. Ba UPND imwe please travel the world and you will know that you know nothing. Your priorities are all upside down and let us tell you something for free, in any country, if you have no infrastructure, you are doomed as a nation. Is HH happy for Zambia after 50 years of independence to have such pathetic International Airports? Is HH happy to see our people die from cholera because of no drainages? Is HH happy to see our children not become innovate because of limited Universities and Colleges? Is HH happy to see our people die due to lack of health facilities? Is HH happy to main roads without street lights? President Lungu is working extremely hard to ensure the basics of life are accessible in all corners of this country and this is what will retain him in power for a long long time to come and not cheap talk and cartels. Successive governments were not serious in these matters thats what cause them defeat. PF IS WINNING AND WINNING BIG!!!! As usual CK parroting economic terms acquired through rote learning. Spot on…A honest learned individual will be explicit about what they done and passionately give you a timeline…imagine a CEO making such vague statements at a AGM..when the company is in heavy debt. DA Projects Management Limited Zambia support the statement that Government must take stock of Agriculture activities. Share Block Farm Projects is the only.! way to farm in Africa. DA project Management believe in Government Led …Commercial Private sector driven..Community Small-RURAL FARMER BASED PROJECTS. i DO NOT UNDERSTAND THE DELAY IN IMPLEMENTING THE PROCESS. DA Projects Management have the Exprtise ..Skills and Funds to implement and manage such projects. Simple making vague statements and jaegon..
Currency speculators are now panicing hence the appreciation of the kwacha and they are now offloading their horded dollars for fear of more losses. 50 years Plus and on after independence we are still talking about coming up with a plan to revitalize our Agricultural sector or diversify our economy? God help us. And we wonder why Chinese nationals sell chickens, Eggs, Bricks and roast maize in the street of Zambia? It is because of our spent politicians who only think when they are told to speak, before then they are asleep sound asleep. Spokes Chola (MHSRIP) once sang ” Welensky so mone ifyo twaonaule chalo” literally transleted Welensky (Former Governor of Northern Rhodesia- now Zambia) come back and see how we have spoiled the nation. These old politics must come to an end. We need more action oriented approach to our development. We need politicians who can make real wealth for our country NOT rhetoric we have heard since independence coupled with looting of the national treasury mentality.